Batch Video Converter facilitates converting large numbers of files, be them in folders and sub-folders, with 1 click. It is also possible to selectively convert just one video type. Place a tick mark next to the file(s) to convert, or folders. 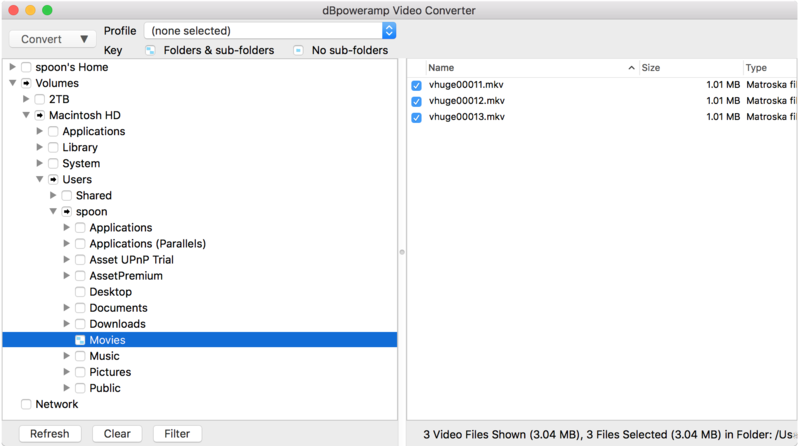 Then click Convert and Video Converter takes over. Individual tracks can be excluded from a folder by clicking on the tick box to remove the tick. By clicking the down arrow next to Convert, select Concatenate, order the files and beging conversion as normal. Excluding Video Types It is possible to exclude video types, by clicking the Filter button. Only videos with a check mark are converted. If a profile is created, or select a previous profile: all selections are automatically saved to that profile, this also includes all entries under 'Filter' and settings made later in Video Converter.